Russia aims to become the first country in the BRICS group of leading emerging economies to ratify an agreement on the foreign currency reserve pool, according to Russian Foreign Ministry Ambassador-at-Large Vadim Lukov. "An agreement will be ratified soon on establishing a pool of foreign currency reserves. Russia will most likely be the first country to do this,"Lukov said on Friday. South Africa will contribute $5 billion, Russia, India and Brazil will allocate $18 billion each while China will provide the remaining funds, according to the envoy. The goal of the pool is so that BRICS member states could urgently replenish their liquidity from it in different proportions to resolve problems with their balance of payments. Meanwhile, Moscow is sure that new members will eventually join the New Development Bank (NBD), as the group wants to avoid it being called the ‘Bank of BRICS’. In July, BRICS members signed an agreement in Brazil to forge ahead with the $100 billion NDB, which would also possess a reserve currency pool worth over another $100 billion. Experts from BRICS countries are also discussing the creation of a new independent rating agency the Russian envoy said, adding that China’s rating agency Dagong was currently in talks with Russia on the issue. The new Universal Credit Rating Group (UCRG) is to rival the so-called ‘Big Three’ that currently dominate the industry. The creation of an alternative agency was raised after Standard & Poor's, Moody's, and Fitch Group downgraded their rating regarding Russia’s creditworthiness following the Western anti-Russia sanctions. The BRICS grouping of emerging market economies will meet for summit twice this year; on July 8-9 in Ufa, and either on November 15 or 16 on the sidelines of the G20 summit in Antalya. Some 120 events will be held in 16 cities within the program of Russia’s BRICS presidency program. Nineteen meetings will be held at the ministerial level. 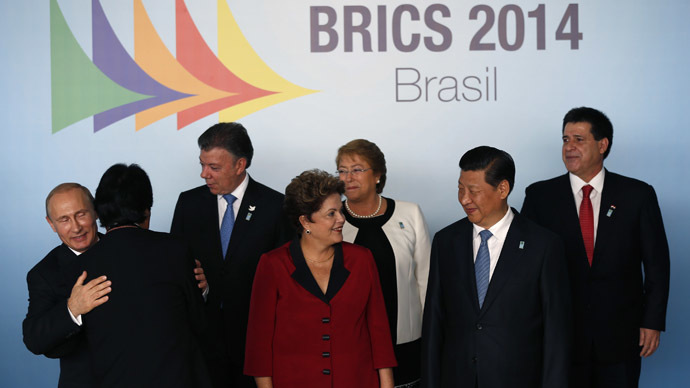 Russia took over the presidency of the BRICS group from Brazil on Wednesday. President of the Russian Chamber of Commerce Sergey Katyrin became the BRICS Business Council head. The BRICS group of prominent emerging economies was established in 2010, when South Africa joined Brazil, Russia, India and China in what was previously known as BRIC. The BRICS countries make up about 40 percent of the world's population and command a combined economy of about $16 trillion.